10PM-2AM: Join us for a dance party under the stars! DJ Stylus spins a special set inspired by motion picture blockbuster The Black Panther and hit single “All the Stars” by Kendrick Lamar + SZA. It will be Afrofuturistic vibes all night across a span of genres for the rest of the night. Light eats and cocktails will be available for purchase. Vendors will be on site. 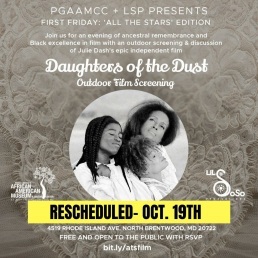 7PM-10PM: Join us for an evening of ancestral remembrance and Black excellence in film with an outdoor screening and discussion of Julie Dash’s epic independent film Daughters of the Dust. Pre-screening lecture on the Gullah will begin at 7:30PM, followed by film screening. Lighteats and cocktails will be available for purchase. Vendors will also be on site. Distinguished advocates and reformers will discuss how racism affects both police performance and the communities in which they work. Ron Hampton, 20+ year veteran of DC Police Department and a National Police Accountability Project board member will provide the national context of police misconduct and reforms. Jonathan Hutto, long-time social justice activist in Prince Georges County and author on social justice issues, will speak to the history of community policing concerns and reform efforts in our County. Proceeds from this event will support the PGCAAMCC and the ongoing reform work of the panelists. Vivid Gallery and The Prince George’s African American Museum’s collaborative exhibitions, 7/8 …9 and 40 Acres Deferred look at regional migratory patterns, and explorations of the contrived “American Dream”. The significance of the collaboration is further contextualized by the importance of the African American history within North Brentwood, MD and the Anacostia Neighborhood of Washington, D.C.
7/8…9 runs from October 12 – November 17, 2018 in Vivid Gallery inside of the Anacostia Arts Center (1231 Good Hope Rd SE, Washington DC 20020) The opening reception will be held on October 13 from 2-5 PM, and is free and open to the public. Gallery hours are Tuesday – Saturday 10AM-7PM and by appointment. Featured in 7/8..9 are Sandra Davis, Carmen Mazyck, Beverly Price, Tim Davis, Ayanna Long, Jerrell Gibbs, and David Cassidy. The work of these artists give a clear definition of the concept of home. In a neighborhood that has a large population of longtime Washingtonians with an influx of new residents while the narrative of the historic area is being crafted time and again, the idea of “home” becomes well worth the discussion. With PGAAMCC’s exploration of “home” in a suburban context within the African American story, we get a wholistic view of what “home” is and why we make those choices. 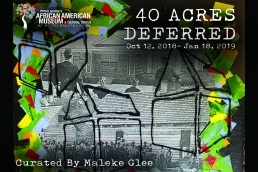 40 Acres Deferred and 7/8 … 9 makes connections between intentional migration to the suburban landscape and the forcible displacement into undeveloped and pockets of the city and suburb. Whether intentionally or forcibly occupying space, whether in the city, country, or suburb, Black Americans have developed culture, traditions and communal values that echo our connection across the Diaspora, a sense of home and belonging. Explore how racism and cultural insensitivity manifest in our everyday lives, our classrooms, popular culture, and online. Empower participants with the tools to counter problematic narratives; facilitate productive, non-harmful conversations with students; and ensure that classrooms are safe, non-triggering spaces for learning. Participants will learn the ways that technology can be helpful vs. harmful and how to incorporate culturally literate, anti-racist practices into their work as educators in an ever-changing, digital world. Registrants may register for one or all of the sessions; they will serve as stand-alone workshops as well as part of a cohesive series that addresses different facets of cultural competency. Prince George’s African American Museum and Cultural Center (PGAAMCC) is proud to announce our summer exhibitions. PGAAMCC presents a versatile, multi-generational group of artists in the exhibitions If I knew then what I know now curated by Yaya Bey and Mothership to the Ancestral Plane curated by our Education Curator, Synatra Smith, Ph.D. Join us on Friday, June 1st 6-9pm for the opening of this exciting exhibition series. f I knew then what I know now is an exhibition about Black childhood. Curator, Yaya Bey introduces and questions how the nuance of digital media might have impacted the childhood, connection to Black culture, and the community to both the featured artists and our patrons. Bey presents works that combine installations, polaroids, and an open dialogue about re-imagining Black childhood. With access to cyber-communities and places of cultural affinity, Bey challenges our audience and asks if we are now more informed to navigate the intersections of Blackness? What does this collective consciousness mean for future generations? Artists include: Imar Hutchins, Josef Isaiah K., Things by Demetria, and Quinci Baker. Mothership to the Ancestral Plane is an afro-futurist youth exhibition featuring art works created by students in PGAAMCC’s teen after-school program, Culture Keepers. After seven months of research and production, the students’ work demonstrates an afro-futuristic reality. These imaginings might be actualized as these young artists mature into adulthood, and technology continues to advance. The pieces were developed concurrently with the release of the Marvel film Black Panther, which provided an updated launching point from which the students could understand and execute the aesthetic.